• Cut and score papers. Round edges with the edge rounder on the Envelope Punch Board (133774). Create Easter eggs with the Layering Ovals smallest oval piece. 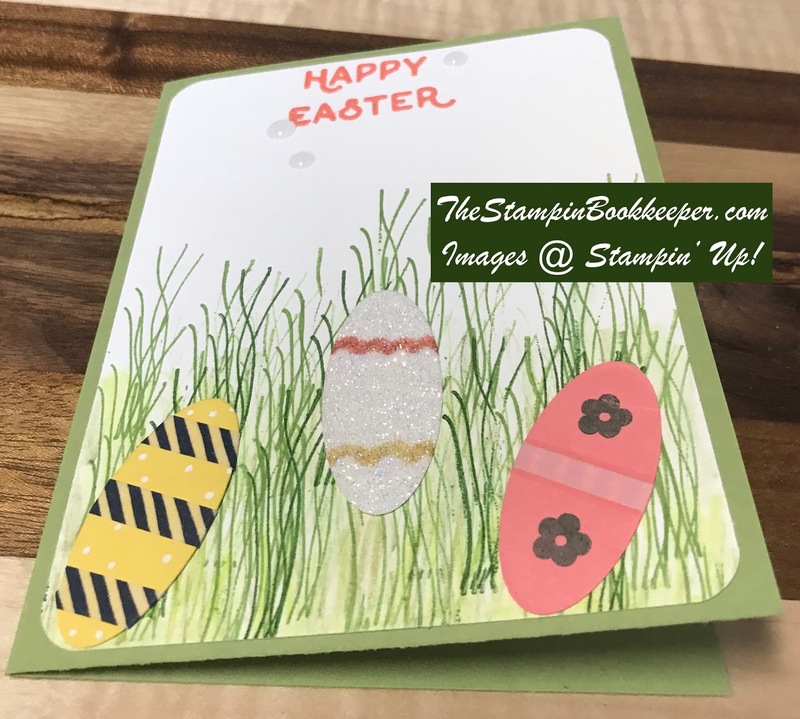 • Stamp a Whisper White piece of cardstock with the sentiment.This is done by dusting over the card surface with the Emossing Buddy, stamping with Versamark ink, cover with Calypso Coral Emboss powder (this has been discontinued), and heat set. Stamp grass using the Daisy Delight stamp set. I used different colors of green from inks and watercolor pencils to get a blended effect. Stamp die cuts with smallest flower from the Hello Easter set and decorate with Washi Tape, and Markers. • Attach White Whisper layer to the card base. • Use enamels to embellish.